A new luxurious chalet set in a wonderful located in Valle de Chamonix (Chamonix Valley) with stunning views of Mont Blanc. The chalet is tastefully furnished. The 210-sq.m is peaceful, contemporary, and spacious. Both the structure and the finish offer a high level of comfort. I am 50, called Sacha, and married with two children We live in Geneva and came to Valle de Chamonix 20 years ago. The Chamonix region boasts the magnificent Mont-Blanc. A magnificent chalet, built in 2011. The chalet has been carefully decorated and furnished to a high standard, so that every guest can feel completely at home. The chalet is even prettier and more practical than you can tell in the photos. Offers panoramic views of the Mont Blanc massif. We provide bed linen for 10 people. 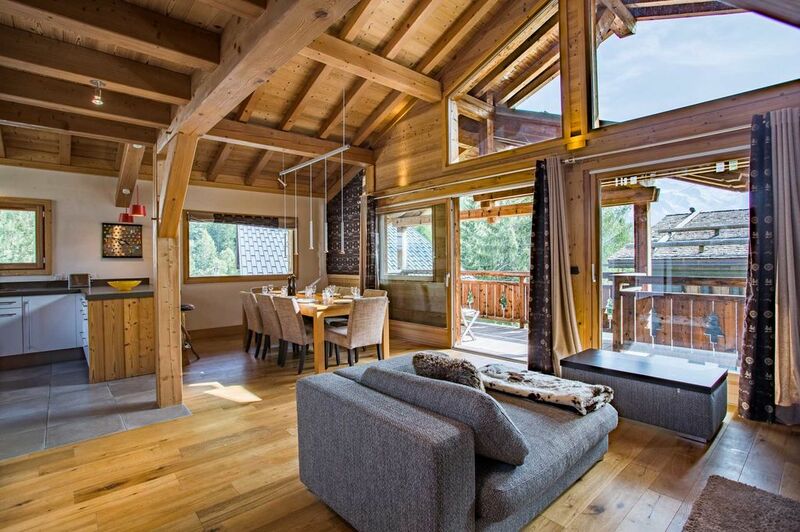 A beautiful , spacious chalet in a perfect location for getting to and from the fabulous Grand Montet skiing area . Ideal for families with ample cooking facilities and a gorgeous log fire to relax by . Very well kitted out kitchen , utility and living areas but one criticism would be the sleeping arrangements, all of the beds are double which was not ideal for kids sharing and led to some cranky children some mornings after a poor nights sleep , pillows were also of poor quality. We had a fabulous holiday and Sacha and his wife were the perfect hosts , tending to every need if necessary . We would love to come back next year but the sleeping arrangements would absolutely stop us from returning, unfortunately. I happy you had a great time and sad that the double-bed didn't fit for your kids. We always mentioned in our avertisement and in our communication there is only double bed in the chalet and no single bed so it is unfortunately you had this surprise during your stay. Concerning the pillow we will check all of them and replace the old ones. We stayed in the chalet for a week in August and it did not disappoint in any way. Everything about this chalet is 5-star, and it was a pleasure to stay there. The layout has been very well thought through, from the 3 double bedrooms with en-suite all on one floor to the gorgeous open plan kitchen, dining and living space which benefits from an amazing amount of windows at the front of the property. It was also lovely to have the addition of the sauna and shower downstairs with the excellent fully equipped laundry room. Our whole family really enjoyed our time here and will definitely be looking to return in the future. If you chose to stay here, I can guarantee you would not be disappointed! We are so happy you enjoyed our chalet and your stay in the Chamonix valley. We would like to thank you for leaving the chalet clean when you left and we hope to see you next time you will be back. Beautifully appointed chalet with everything you could possibly want for a self catering holiday. We all had en suite bathrooms, comfortable beds, lots of storage space and space for all the ski kit. We wish you all the best for 2017. Excellent stay overall. Brand new chalet with very high specs (especially kitchen with great equipement). Great views on G. Montets and Mont Blanc. Conveniently located in front of shuttle bus stop (although it does not run as often as claimed in morning and evenings). Great with kids and large group as the chalets is very spacious and includes washer/dryer/sauna. Only negative is parking space for 2 cars only (was told it was because of the recent heavy snow fall). Parking lot is just 100 yards down the road. Owner was very helpful with tips on restaurants and able to provide discount on ski rentals. Plenty of space, very well equipped, clean, comfortable and cosy, on top of very diligent owners. The chalet is very recent and well built, the main room offers a nice view of the Mont Blanc summits. The sauna and shower in the spa room is a great added value. L'accueil est parfait, le chalet très confortable, . Tout y était pour passer d'excellentes vacances en famille. En espérant que vous aurez encore plus de neige une prochaine année. Set less than 500 m from Tour's slopes and less than 1 km from the Grands Montets cable car. Chamonix is 9 km away. The closest bus stop is 50 m away. Apline skiing during the winter. Hiking, cycling, high ropes courses, and golf during the summer months.